Biodiversity is the sum of the variety of living organisms from plants, animals and fungi to micro-organisms invisible to the human eye which makes up and sustains our natural environment. Horndean Parish Council manages large areas of land that is valuable to wildlife including Catherington Down which is designated as a Site of Special Scientific Interest (‘SSSI’) due to its ecological status. Nature reserves within Horndean contain a variety of wildlife and habitats which are nationally scarce or in decline. Unimproved chalk grassland and lowland heath are two of the rarest habitats in Britain, in terms of the total area they cover. Most people realise how lucky we are to have access to these areas, but planning the future of these sites and ensuring their welfare can be challenging and it ultimately requires community interest and cooperation. Biodiversity Action Plans are internationally recognized programs addressing threatened species and habitats designed to protect and restore biological systems. Their principal elements typically include recording information for selected species or habitats; assessing their conservation status; setting targets for conservation and restoration; and establishing timelines and partnerships for its implementation. 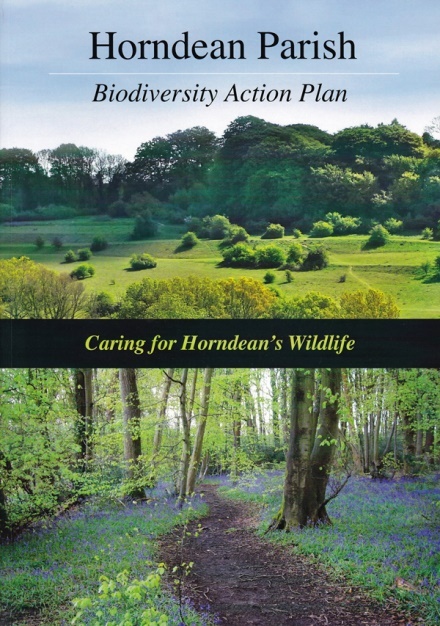 The Biodiversity Action Plan for Horndean has been written by the Horndean Biodiversity Group with the valuable assistance of other organisations including the Hampshire & Isle of Wight Wildlife Trust, The South Downs Group, and the Parish Council. The Plan is intended to raise environmental awareness and provide information about the nature that we have on our doorstep and providing a structured approach to preserving these things and giving suggestions for future actions. Further information and documents are published below. These can be printed for reference, but cannot be altered, and are published in accordance with Crown Copyright regulations. Provide a vision of the community in the future, and how it will be achieved.